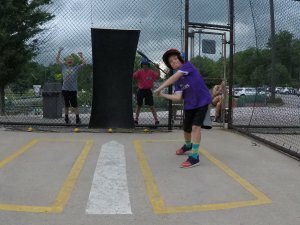 Lahey Family Fun Park has the state-of-the-art cages you need to practice your batting skills or to simply have fun with friends or family. We have a total of 9 cages for you to choose from and your options are limitless. No reservations required. From down the middle, high, low, fast, or slow, you get to choose the speed and height of the pitching machine when you step into the hitter batting cage. Our super-sized batting cage is 145 ft. deep, 50 ft. high, and 134 ft. wide so that the hitter can see everything coming. Our complex cage has 3 dual machines which pitch both softball and regular baseballs. Discover your batting talents when you step into our incredible batting cages today!